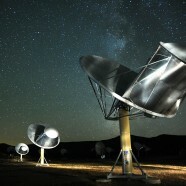 On the evening of Thursday the 11th September Dr Andrew Siemion of the University of California at Berkeley and ASTRON (the Netherlands Institute for Radio Astronomy) will be giving a public lecture at Birkbeck in London entitled The Search for Extraterrestrial Intelligence: The Quest to Find Ourselves Among the Stars. Find out more information here. Attendance is free but booking is required. Head to the link and click on the word ‘booking’ in the last but one line of the talk description. And remember to take your ticket!